This cheat sheet by Corey Smith can help you discover which social network is right for you. 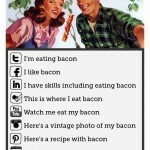 “I’m eating bacon,” simply states why I prefer Twitter to the alternatives. The New Yorker has an interesting look at the robotic side of Twitter and the challenges the service will face as it becomes a bigger business. As a service, Twitter’s greatest strength is that its users have total control over whom they follow and what they see. As a business, Twitter’s greatest opportunity is in violating that control with advertisements. My apologies, there are no gift ideas for women in here. If you don’t know what to buy a woman for Christmas, you’re an idiot. @GSElevator, who authored this post, is behind what is very possibly my favorite non-personal Twitter account, mostly because of his quips like this and seasonal jokes like this. 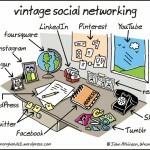 I guess social networks have already been around for a while. Paris is the Paris of things that other things are the thing of. Hotspot.io gathered twitter mentions of Superbowl ads and presented them in a beautiful graph.